We’re on the downward spiral. With two weeks to go now, there’s little more to be done in terms of training. Now it’s all about tweaking the bike so it’s in ideal shape, steadily putting by favourite socks and shorts that won’t be used again ’til the big day, and having a last minute root around online for those little gems of information. Tuesday 2nd: 2.5k swim in just over an hour. We had been out most of the night at a large fire, and by the time we got back to base, it was either collapse into bed for a few hours, or stay up. So I stayed up, read the news online and had some early breakfast, and then hit the 8.00 am session. Yep. Martyr to the cause, me. Wednesday 3rd: A slightly longer run of 12.6k in the park@5.56 pace, in 1.14:47. Friday 5th: 70 lengths in the 45 minute session in the evening, or 1,750 metres, if you prefer. Either way, a good session. Saturday 6th: Run with Mark in the park. Very humid evening. We set off at a good pace, and for some odd reason, kept it up. 9.22k in 49.11 minutes, at 5:20 pace. Sweated buckets, and even though it was too late for our ritual hot chocolate in Insomnia, S very kindly made us a homemade version, and very tasty it was too. 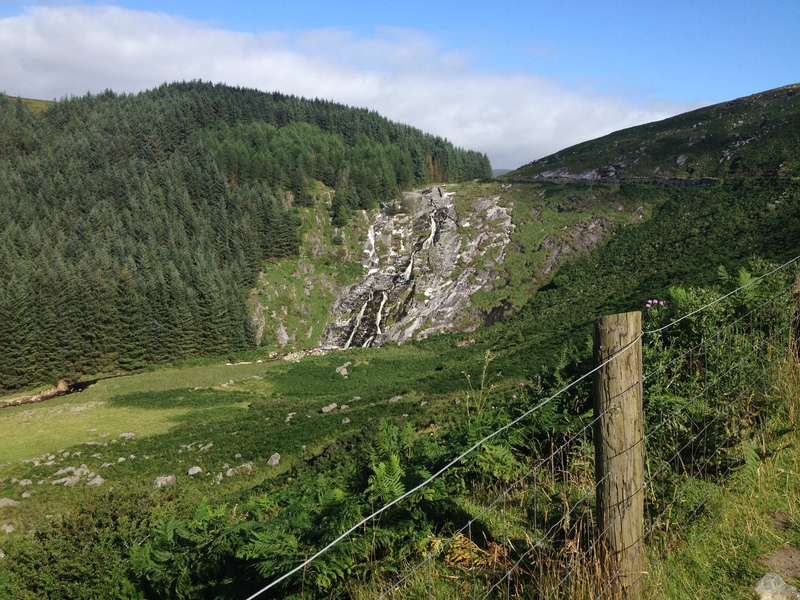 Sunday 7th: Finally got into the Wicklow Mountains. It had become a bit of a hoodoo for me, for no particular reason. I had planned all along to get out on the bike and up around Wicklow Gap and Sally Gap. It would be a staple of any half-decent road cyclist within an asses’ roar of the place. But for some reason, I had avoided it. I had planned to go the previous week, and then the window of opportunity with the brigade had become something of a tight squeeze and I had ended up in flatland territory again, spinning out to Kilcloon and back. So today was the day. Somewhat flustered, I took off out of town towards Valleymount and the long draw up to Wicklow Gap. Halfway up the climb, a bird of prey streaked down the valley; possibly a Peregrine. Hard to say. It was moving, unlike me. The scenery gets ever more stunning as you gain altitude, and it is a long, steady draw all they up to gates of Turlough Hill. Corrie lake at the top of Wicklow Gap. Once over the brow of the hill, the wind hits you as your first reward. Your second is to be able to whizz down the other side towards Glendalough, and I clocked up 70km/h. One of Ireland’s premier tourist destinations looked busy enough so trundled on past into Laragh, and then a sharp left for Glenmacnass. This is a quieter road – one of the old Military Roads – and is a joy to cycle on. 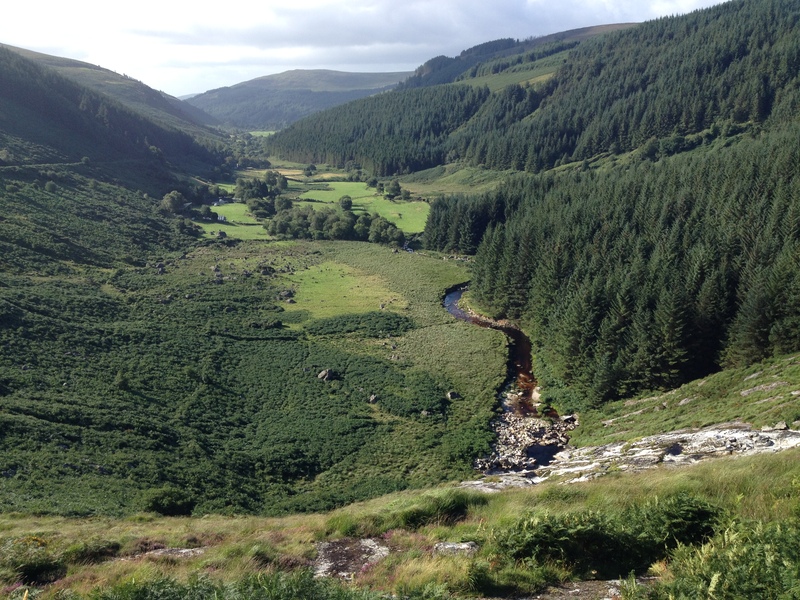 A Jay flew across the road and into the trees to the left, where the Glenmacnass River chuckles away in the valley; a glacial construct with a distinctive u-shape that’s best viewed from the top. But first you have to get there. The road climbs away from the valley floor, and you soon leave the river behind. The climb is worth it. What a view. A quick stop for a snack at the top and then push on into open moorland and Sally Gap. Shortly after I got on the road, I was passed by a cyclist on a tri-bike. After a quick chat and pleasantries, he pushed on at a good pace. No point in trying to keep up, though I had a strange feeling I would see him again. About twenty minutes later, sure enough, there he was on the side of the road, creeping through the wiry grass and heather, clearly looking for something. I pulled over and he recounted how his Garmin had flown off his bars at speed, and had rattled over the road and into the thick vegetation; swallowed without mercy. I set to and we crawled around, looking for the small handful of electronics that costs about 300 quid, and was clearly an item of great sentimental value as much as economic. We got to chatting as you do (when you’re creeping around on all fours in the Wicklow Mountains), and it turned out he was also a fireman, and was once stationed in the same county as me, so we had plenty in common. Willie is a two-time ironman, so had some good advice. But despite my good fortune at meeting a fellow fireman who knew the hardman cycle route well and could offer some valuable advice, I couldn’t return the favour, and the Garmin, like Jason Bourne, seemed determined not to be found. In the end I conceded defeat, apologised, and went on my way. This section of the ride is beautifully bleak with wide open expanses of Ling Heather that swallow the road ahead. Sally Gap came and went, and the wind returned with a vengeance as I pointed the bike down the valley with the youthful Liffey on my left. Compared to the 70k speed coming off the Wicklow Gap, this was hard to reach 50, and stay on the bike. The crossroads at Sally Gap. It can be quite bleak here, even in Summer. In Winter, it is often impassable. You drop quite quickly into Manor Kilbride, and the wild, windy weather leaves you be as you do. It’s no wonder the Sally Gap road is often impassable in the winter. As I reached the T junction, I paused to get my bearings. I wanted to head back in to Blessington by the lake, and not the busy N81, so it was left for me. I had managed about a hundred yards when I heard a shout behind me. Sure enough, for the third time that day, there was Willie on his bike. A few minutes after I’d left, the Garmin had been found and reseated on the bars. One very happy cyclist. He turned back for the main road and I went on by the lake. A chance encounter in three parts. Best of luck to you, Willie, in the Lost Sheep Triathlon next month. Overall, it was a very enjoyable 75k. I suspect that translates into a longer ride on the flat, given the amount of climbing involved. But I’m just happy to have got the experience under the belt. I follow Jim’s Fit Recovery blog. And here’s a recent post about the joy of cycling with others. I know I am a social animal at heart, but there has always been another side to me that’s quite happy with my own company. And no harm too, because I have done all my triathlon training on my own, with just one group spin over a year ago. Cycling is a great way to discover new little routes and roads around your neighbourhood, and when you’re on your own, you tend to really absorb your surroundings better than if you’re in a group, making sure not to tip someone’s wheel, or sharing the front, or chatting. That’s my take anyway. I’m sure I would get good craic out of a group cycle, and possibly improve my overall endurance and techniques. But at the end of the day, the triathlon cycle is a lonely event. Drafting is criminal offence, punishable by time penalties or disqualification. So I have just got used to being on my own. A shout out for parkrun! Looks like a fab ride. Love the Pano you took! Best of luck with the taper. Maybe not.. I find all the ‘waiting’ immensely frustrating. Well yes, there is that indeed. I fill the time with endless nonsense such as checking the weather, making endless lists of gear to bring, and fretting. It’s the last one I could do without! Yeah. Considering there’s only about 3,ooo in the country, to meet one at all is something. To meet one who worked in the same county with some of the same guys is very unusual indeed. Lovely fella. I always say, “I’ll taper when I’m dead”. I hate tapering.